Also joining the auto-abandon crowd. Just had a gold x garland go straight to the AP, and I'm normally good about checking before doing a breeding like that. Oh well. Changed the parents' names to see if I can get it back, but if not, at least I have the rest of the year to breed another. EDIT: Forgot to mention the other stupid thing I did. I bought a Siyat from the market when I realized I didn't have a male of a specific color... and influenced it female. Didn't even realize until today, when I went to breed it with its intended mate. The color mechanic of Siyats will make raising another one even more annoying. 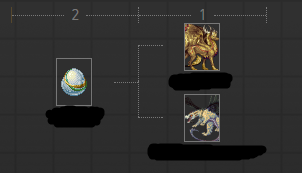 Didn't catch it, but I clicked on an egg in the AP, checked the lineage, and found a 3g Garland too. 2g Winter Magi x Arcana; PM me please! Please PM me if interested in a bloodswap for either of these. I'm about to go to bed, but I'll answer first thing in the morning. Bloodswaps please! Feel free to PM. 5G EG From Spriter's Alts - Thanks, anon! Time to post Valentine's catches now that it's over! https://dragcave.net/lineage/g3tBr- 2g Sweetling x Nhiostrife; thank you Nakuru! https://dragcave.net/lineage/eEE1P- 3g Sweetling x Tan Ridgewing, thank you Nyara! I didn't want too many 3g checkers I didn't have mates for already, but this one is very pretty. https://dragcave.net/lineage/MQBJt- 4g Sweetling x Blusang with alt base. Thank you bloodonmyfangs! I love the alt CBs. https://dragcave.net/lineage/kgdts- 2g Rosebud x Gray. Eeeee, I can finally breed a mate to this lady! Thank you so much tishavara! https://dragcave.net/lineage/tyYGS- 2g Rosebud x Blusang, thank you arenee1999. Surprised by how pretty this looks, definitely breeding a mate! https://dragcave.net/lineage/J7L2M- 2g Rosebud x White- simple, but pretty. The parents both have 4-digit codes too. Thank you breeder! https://dragcave.net/lineage/MEEXY- 2g Rosebud x Black Marrow, thank you breeder! I love the code of this one. https://dragcave.net/lineage/NS3QG- 2g Rosebud x Almandine, thank you breeder! Almandines go great with the lighter pinks/whites of the rosebuds. https://dragcave.net/lineage/O9Lch- 3g Rosebud x Grave, thank you johnnalola! Very interesting pairing. https://dragcave.net/lineage/GaRzy- 3g Rosebud x Gaia. Thank you breeder! I actually caught a sibling to this first, but went with this egg for the code. https://dragcave.net/lineage/GrtHX- 2g Arsani x GoN, thank you ScytheDragon! I'll have to see if I can find a mate for this. Too bad Arsani x GoN makes Avatars of Change instead of Creation. https://dragcave.net/lineage/nj9ul- Inbred nhiostrife checker from Caballo Marino; thank you so much DragonMaiden! This is gorgeous. https://dragcave.net/lineage/vKi1h- 2g RA x Hellfire Wyvern. Anything with female hellfires is gorgeous, of course. Thank you breeder! This'll make a pretty checker. https://dragcave.net/lineage/2zTvu- 3g Heartstealing x Black. Wow, this is exactly what I was looking for all event and had given up on finding. Thank you so much prpldrgnfr! https://dragcave.net/lineage/l1lMt- 2g Heartstealing x Chrono Xenowyrm; I love the names, thank you breeder! https://dragcave.net/lineage/YmFd2- 3g Heartstealing x Kingcrowne. I was planning on looking for one of these since I've been building this lineage, and I ended up finding one right away! Thank you so much Terces! https://dragcave.net/lineage/ktMdB- 4g Almandine x Heartstealing, again from Terces! The bottom half of the lineage is actually my dragons, but I neglected to keep one for myself last year, so this'll be useful for continuing the lineage. And the luckiest catch, 2g Heartstealing x Black from the Heartstealing spriter's alt! Thank you so much, breeder/spriter. Still on CD, so PM me please. 2g from other spriters' alt. Very happy to keep this otherwise. Fogged for safety, PM me please! I arranged a trade for a beautiful 3g EG Striped River from spriters' alts. I had it fogged, since I was being so careful, and unfogged it to admire the lineage... only to promptly abandon it? I have no recollection of this, but apparently I did it. 3g Enraged Aegis x Desipis: Thank you Waldmensch! He'll be enraged after the next failed vampire bite/other accident. 3g Winter Magi x Thunder: Thank you @tjenni! I think I may actually have a mate for this sitting around somewhere. Holly x Silver Shimmer Deadline: Thank you @Ashtoret! Deadlines are probably my favorite type of lineage. Might take a year, but definitely planning on a breeding a mate for this to make it into a deadline checker. 4g Mistletoe x Gaia: Thank you Ramani! Very pretty, I never thought about this pairing. Love how the shades of green go together. 2g Snow x Frill: Thank you breeder! I'll see about breeding a mate for this. 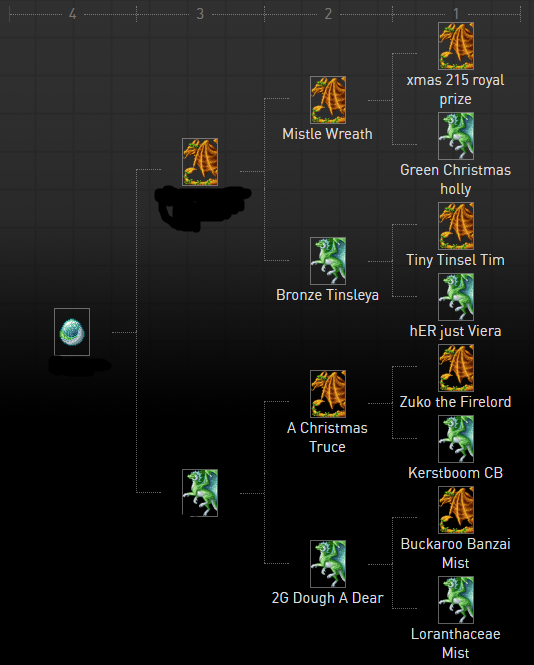 4g Mistletoe x Bronze Tinsel: Thank you harlequinraven! I don't know if I've seen a prize checker get to such a high generation before. 2g Snow from Tan Spriter's Alt x Khusa: Thank you very much breeder/spriter! <3 This one is lovely. I can also breed some 3g Winter Magi checkers and a Gold x Winter Magi checker up to 5g, I believe. Your choice of mate, of course. Please offer a dummy, would appreciate a post here as well. Please offer a dummy. Posts would be appreciated. This mottled red egg almost glows from within. Actually from last year, but I'm really remembering it now after Valentines breeding. For the 2016 Valentine dragons, I only had one incubate left, so I used it one of my CBs so I'd have one to breed with sooner. I go on DC rarely except for holidays, so I forgot about this site. Turned out one had died, but the non-incubated egg still had around 17 hours left. That's how I ended up with only one mutamore. :'( At least Mutamores are my least favorite Valentines, but still, they're kind of charming. At least I have one. This really changed how I raise eggs- now I always put them in one hatchery after their first day, just in case I forget, and only incubate with less than 5 days left. At least that's a positive. 3G Almandine x Heartstealing, thank you breeder! Beautiful combo, I'll find a mate for her! Glad you like it, love the name you chose for her! 4th Gen Rosebud x Nebula- Thank you elennilda! 3th Gen Heartseeker x Ribbon Dancer with Spriters' Alts- Wow, thank you very much breeder! 4th Gen Heartseeker x Turpentine- Thank you breeder! 3rd Gen RA x Balloon- Very pretty, thank you breeder! 2nd Gen RA x Shadow Walker- Nice, thank you graves! 3rd Gen RA x Thunder- Ooh, thank you breeder! I'll try to find a mate for this one. 3rd Gen Heartstealer x Water- Thank you breeder! 2nd Gen Heartstealer x Xeno Magi- Thank you HoodaThunkIt! I think I might actually have a mate sitting around somewhere. 3rd Gen Aria x Winter Magi- Thank you very much for this one, Lavinia! I happened to be working on a 3rd gen checker with my existing dragons when I caught this, so I'm already able to make a fourth gen.
Or heck, just replace the sprites immediately with whatever other amazing Valentine concept was second place this time around. I imagine there's at least a dozen nice options.